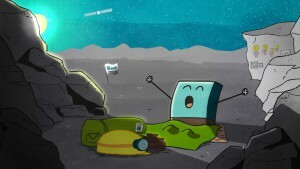 One of the most expected news in the last months has arrived : the module Philae finally contacted his probe Rosetta last Sunday, 14th June 2015, after more than 7 months hibernating on the surface of the comet 67P/Churiumov-Guerasimenko, confirming thus that it managed to reactivate its batteries and resist the climatic and environmental conditions of its hostile surroundings. The contact lasted 5s only, but it kindled our hope of getting to analyse for the first time the composition of the ground of a comet, after the unfortunate landing of the module in an area where it gets little solar energy delayed the events. Since the module Philae could not recharge its batteries, it had to hibernate until the environmental conditions improved when the comet approached the sun, allowing it thus to obtain more energy to resume its activities. Currently, the comet is getting closer to the sun and a lot of electromagnetic energy is reaching its surface. Ironically, if Philae had landed in the planned place, now it would not be able to act due to extreme temperatures. Nonetheless, being placed in a semi-shadowed region allows it to perform its scheduled experiments and keep them going for a long time. The Rosetta probe was responsible for propelling the Philae during the latest kilometers of its trip, having the module no propulsion system on its own, and the probe has remained at a sensible distance of 240km from the comet since. But in this moment, the ESA is executing a delicate operation in order to approach the probe to a distance of 50km from the comet, with the purpose of improving the communication between Rosetta and the Philae so the mission of the module can be accomplished easily. The level of activity in the comet is quite high right now, due to its short distance to the sun, and therefore it is releasing huge amounts of dust into space (main cause of the characteristic tail of the comets), which might damage the probe Rosetta, preventing it from communicating with Philae. This mission could help us solving the mystery of the appearance of life on Earth, and what is more, find new information beyond our expectations.